How can you personally lower your exposure to all these chemicals? 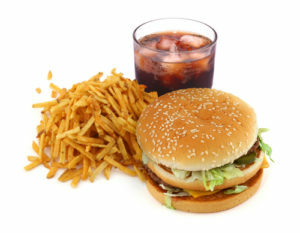 1) Eat as many fresh fruits and vegetables as possible, and avoid eating canned foods (the can lining has BPA or other just as worrisome chemicals - bisphenols), 2) Avoid processed meat, especially during pregnancy (nitrates, nitrites, etc), 3) Avoid microwaving food or liquids in plastic containers (chemicals leach out) - including infant formula and breastmilk, 4) Avoid putting plastics in the dishwasher (chemicals leach out), 5) Use alternatives to plastic such as glass and stainless steel, 6) Avoid plastics with recycling codes 3 (phthalates), 6 (styrene), and 7 (bisphenols) unless plastics are labeled as “biobased” or “greenware,” indicating that they are made from corn and do not contain bisphenols, 7) Wash hands before eating, and wash fruits and vegetables that cannot be peeled. 8) Also - read the ingredients on all labels, and look for "real" ingredients and try to avoid colors, additives, artificial or natural flavors. Chemicals used to preserve, package and enhance food can harm children's health, a leading pediatricians' group says. A growing mound of scientific evidence has linked these chemicals to changes in children's hormone systems, which can alter their normal development and increase their risk of childhood obesity, the new American Academy of Pediatrics (AAP) policy statement argues. The chemical culprits - Some chemicals that affect food safety include: - Bisphenols like BPA, which are used in plastics and the lining of metal cans. They can act like estrogen in the body, affecting onset of puberty, decreasing fertility, increasing body fat and affecting the nervous and immune systems. -Phthalates, which are found in plastics and vinyl tubes used in industrial food production. These chemicals can affect male genital development, increase childhood obesity and contribute to heart disease. - Perfluoroalkyl chemicals (PFCs), used in grease-proof paper food packaging. They might reduce immunity, birth weight and fertility, and can affect the thyroid system. - Percholate, which is added to dry food packaging to control static electricity. It also is known to disrupt thyroid function and can affect early brain development. - Artificial food colors, which have been associated with worsened attention deficit hyperactivity disorder (ADHD) symptoms. - Nitrates and nitrites, which are used to preserve food and enhance color, particularly in cured and processed meats. These chemicals can interfere with thyroid hormone production, and have been linked with gastrointestinal and nervous system cancers. "PFCs can alter thyroid function and metabolic changes. Perchlorate, nitrates and nitrites disrupt thyroid hormone production and inhibit iodine uptake in the body," King explained. "Iodine is extremely important in promoting growth and metabolism in children. Iodine is also essential for early brain and neurological development. Having an iodine deficiency could ultimately lead to poor growth and delayed [thinking] ability," she said.